The word itself was not used until the mid-nineteenth century (in Charles Dickens’ Bleak House). The feeling, however, saw increased expression beginning in the 1760s with the phrase “to be bored,” in the sense of being made weary by tedious conversation. This occurred, significantly, alongside the expansion and transformation of the British Empire after the Seven Years’ War. For centuries, the British Empire has been portrayed as a place of adventure and excitement. Novels and films, from Robinson Crusoe to Lawrence of Arabia, romanticized the empire. Real-life heroes from Walter Raleigh to Cecil Rhodes were celebrated for their vision and valor. Yet in 1896, after only one month in India, twenty-one year old Winston Churchill declared Britain’s largest and most important colony “dull and interesting.” Nor were his views unique. “The same sameness day after day,” complained George Hennessy, a lieutenant colonel serving in Kandahar in 1879 during the Second Afghan War. 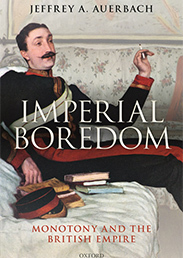 Boredom was particularly a problem for imperial officials “Dullness is the central characteristic of an Indian viceroy’s life,” remarked Lord Dufferin, who resigned a year before his term was up in 1888. “Routine,” noted Leonard Woolf in his diary for 10 November 1908, an entry he repeated each day for four straight days and numerous other times while serving a three—year appointment as a government agent in Ceylon. There were many reasons why British men and women were bored in and by their empire. Some were situational, such as the grueling 3—4 month voyage to India or Australia, the small size of British colonial communities, and the absence of familiar recreational activities. Communication problems were also legendary, especially in the pre-telegraph age when the time lag between letters sent and received meant months of waiting for news. 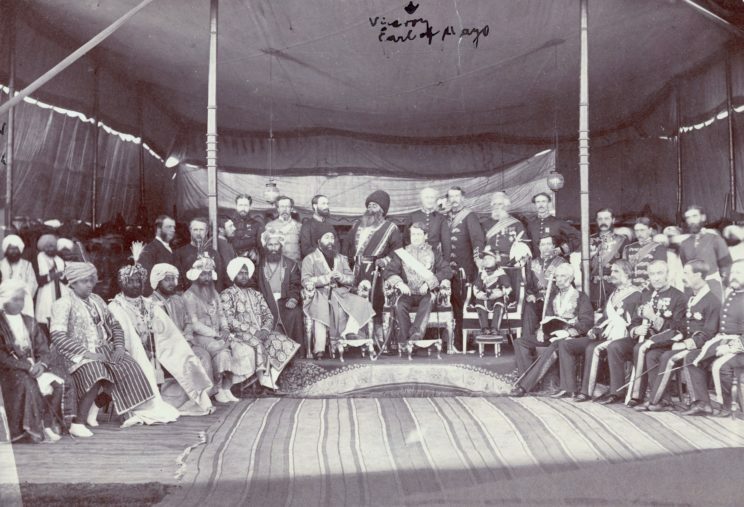 Image credit: The Viceroy of India, 6th Earl of Mayo (1822–1872), receives Sher Ali Khan (1825–1879), Amir of Afghanistan, at Ambala, India, 27th March 1869. Photo by Hulton Archive/Getty Images. Public domain via Wikimedia Commons. Other factors had to do with the changing nature of the empire. The bureaucratization of imperial administration during the nineteenth century produced a marked increase in regulations and paperwork, leaving imperial officials with less influence, autonomy, and free time. Governors and administrators found themselves drowning in dispatches and frustrated by the monotony of what they thought would be a great adventure. There were also fewer opportunities to interact with indigenous people as the empire became increasingly ceremonial. Soldiers were affected as well. Despite Britain’s many colonial wars, some regiments experienced lengthy gaps between periods of active duty. The Royal Lincolnshire, after serving in India from 1846—58, did not fight again until it was sent to Malaya in 1875—6, and then endured another long hiatus until it went to the Sudan in 1898. And the Cheshire Regiment, which fought in the Sind War of 1843, was essentially at rest for forty—five years afterwards until it saw action in Burma in the late 1880s. Soldiers stationed in the empire could go decades without participating in a single skirmish. Changes in the size of the British Empire also influenced imperial soldiering. By 1900 Britain was supervising, formally or informally, an empire on which the sun never set, and with it came massive administrative responsibilities as the predictability of policing replaced the thrill of conquest. Many soldiers who had enlisted with enthusiasm succumbed to “apathetic indifference” and a loss of motivation. Some resigned from military service simply because they were bored. The boredom experienced by the British in the service of their empire has many parallels in the contemporary world, and not just in Britain. In 2016, British Armed Forces Minister Mike Penning, who joined the Grenadier Guards as a 16—year old and later served in Kenya and Northern Ireland, confessed that he got “very bored” in the Army, a sentiment shared by soldiers on both sides of the Atlantic, including former US marine Anthony Swofford, who confessed in Jarhead (2003), his chronicle of the Gulf War, that his “despair” was from “boredom and loneliness.” Expats, too, have complained about getting bored with their lives overseas. And, it is clear that when businessmen are dispatched to faraway offices, the managers who send them need to be mindful that the excitement of a foreign posting can quickly dissipate, undermining morale and productivity. Finally, there is the tragic story of the two Navy SEALS who died of a heroin overdose on board the Maersk Alabama, one of the largest cargo ships in the world, which they had been hired to protect from pirates. Boredom, the men had told their friends, was the real enemy at sea, and perhaps of empire­—building more broadly. Jeffrey Auerbach is Professor of History at California State University, Northridge, in Los Angeles. He is the author of The Great Exhibition of 1851: A Nation on Display (1999) and the recently published Imperial Boredom: Monotony and the British Empire (2018). “dull and UNinteresting”, I think. Um, Oxford University Press, why are there m-dashes throughout this article where there should be hyphens?